Call us today for commercial door repairs! Express Entrance Services is a new idea in commercial door service companies. We are a customer-oriented company believing that your repairs should be done right the first time and in a timely fashion. If you call in a service request before 2:00pm, we will respond before day's end. We offer complete commercial door repair services for automatic doors and manual doors. Demand Service: Consisting of a standard hourly rate, plus parts and commercial door repairs. Preventative Maintenance Service: Regular scheduled 14-point inspections to correct problems before equipment failure. Preventative Maintenance Plus: This program provides most of the minor parts required during PM inspections, as well as a discounted rate on major components and labor. Quoted Service: When you want to know the cost before the repair is made. Nabco Entrances the leader in the entrance systems industry, offers an exclusive line of Gyro Tech® products for the North American market. Each Gyro Tech product provides cutting-edge technology enhanced by dependable service and competitive pricing to give you total performance and value. 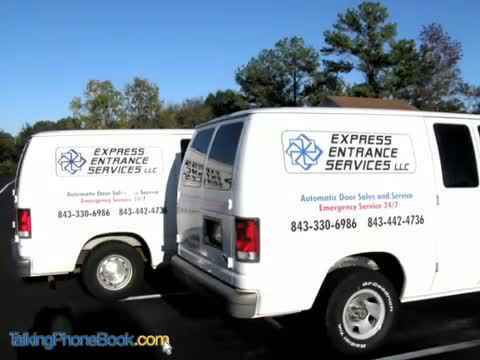 When you are looking for commercial door repairs in the Charleston, SC or Myrtle Beach, SC areas, rely on Express Entrance Services LLC. From commercial entry door systems and custom doors to store entrances and storefronts, we can help. Call our trained technicians today for more information on commercial door repairs and more. If there is an issue with the proper functioning of your door, don't let it go unnoticed and cause bigger, expensive problems eventually. We specialize in commercial door repairs and can handle both automatic and manual door repairs in the Charleston, SC area. We can also restore handicapped door openers with our expert repair services. We will arrive on time and ensure that your repair is done right the first time. Call us today for commercial door repair services. We offer handicapped door openers! NABCO Advanced Sensor Systems offer performance, energy efficiency and compliance with all ANSI standards. NABCO Sensors now have dual voltage capability for handicapped door openers. The Acuwave "Touchless" sensor responds to a voluntary hand motion within the detection area. It is the ideal solution for heavy pedestrian-cross traffic areas such as sidewalks or hallways, and for "hands-free" environments like restrooms, healthcare facilities and clean rooms. The Acuwave will help prevent unnecessary door opening cycles, keeping conditioned air inside your facility in and around Charleston, SC and saving energy. This Complete Sensing System for swing doors employs focused, infrared sensored mounted on each side of the door to detect objects in the swing path. Acugard 3 sensors systematically adjust as walls or guide rails overlap the sensing area, providing continuous presence sensing throughout the door cycle. An Acumotion A sensor, included with the system, provides activation. Acugard 3 LE provides added pedestrian protection to low-energy/ADA doors. Perfect for your Myrtle Beach, SC business. Acuvision Learning Sensor System for slide, swing or folding doors provides enhanced presence sensing covering the entire threshold area and moving path of the door. A unique ability to memorize the slide or swing path of the door allows for extended coverage which exceeds industry standards. Call us today for more information about our residential and commercial doors in Charleston, SC and Myrtle Beach, SC. From automatic doors to manual doors and handicapped door openers, we've got it all. At Express Entrance Services, our goal is to provide you with the best service we can. Commercial Entrance Ways, Automatic Doors, Swing Doors, Sliding Doors, Storefronts, Design & Installation, Custom Doors, Glass Doors, Store Entrances, Steel Doors, Store Fronts, Entry Doors, Residential, Handicapped Accessibility.